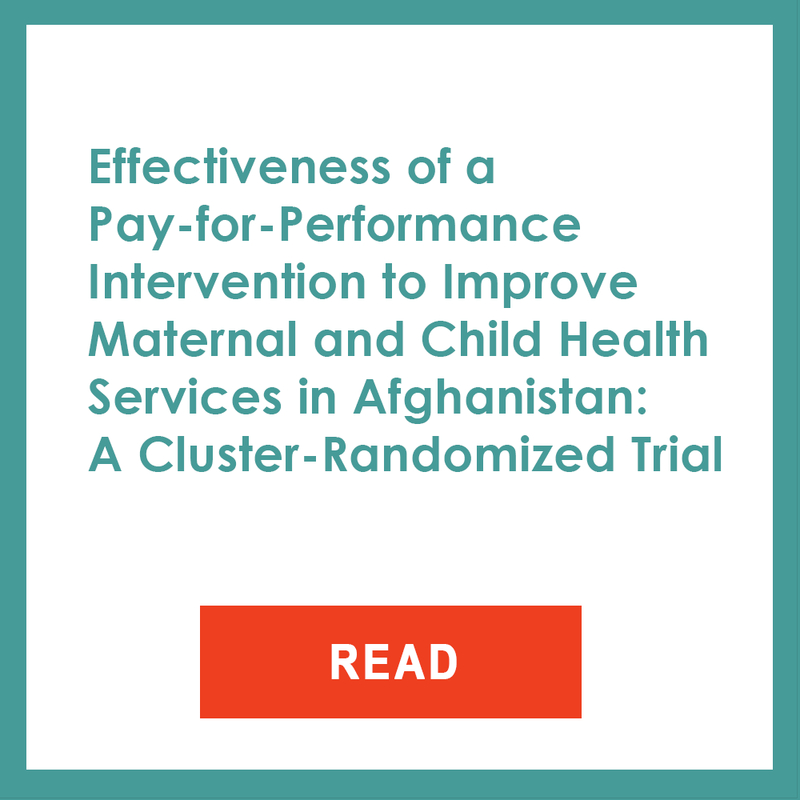 A cluster randomized trial of a pay-for-performance (P4P) scheme was implemented in Afghanistan to test whether P4P could improve maternal and child (MCH) services. All 442 primary care facilities in 11 provinces were matched by type of facility and outpatient volume, and randomly assigned to the P4P or comparison arm. P4P facilities were given bonus payments based on the MCH services provided. An endline household sample survey was conducted in 72 randomly selected matched pair catchment areas (3421 P4P households; 3427 comparison). The quality of services was assessed in 25 81 randomly sampled matched pairs of facilities. Data collectors and households were blinded to the intervention assignment. MCH outcomes were assessed at the cluster level. There were no substantial differences in any of the five MCH coverage indicators (P4P vs comparison): modern contraception(10.7% vs 11.2% (P ¼ 0.90); antenatal care: 30 56.2% vs 55.6% (P ¼ 0.94); skilled birth attendance (33.9% vs 28.5%, P ¼ 0.17); postnatal care (31.2% vs 30.3%, P ¼ 0.98); and childhood pentavalent3 vaccination (49.6 vs 52.3%, P ¼ 0.41), or in the equity measures. There were substantial increases in the quality of history and physical examinations index (P ¼ 0.01); client counselling index (P ¼ 0.01); and time spent with patients (P ¼ 0.05). Health workers reported limited understanding 35 about the bonuses.